In November 2012, as newspapers reported, an “all-but-forgotten” painting by A.Y. Jackson, “Radium Mine” (1938), emerged from the private collection of a prolific prospector. The painting went to auction, selling for an astounding $643,500, and, fleetingly, popular news sources grazed the surface of a subterranean history that disrupts the very bedrock of Canadian identity. In the foreground of the painting, a craggy outcrop slopes down into the pale blues and greys of Great Bear Lake in the Northwest Territories—just hidden from view is the head frame of a radium and uranium mine that produced ore for the American nuclear arms program in the 1940s and 50s. Media attention sparked by the sale of the painting was only short-lived and the story of Canada’s uranium project on Great Bear Lake quickly returned to the archives. However, for people who live in Délįne, NWT, a small fly-in community across Great Bear Lake from the former Port Radium mine, the story told by Jackson’s painting remains part of everyday life as the community continues to grapple with the environmental and health legacies of the mine. A.Y. Jackson was a founding member of the Group of Seven, that group of Canadian landscape painters formed in 1920 and oft credited with shaping a Canadian school of art (Hill, 1995; Jessup, 1998). 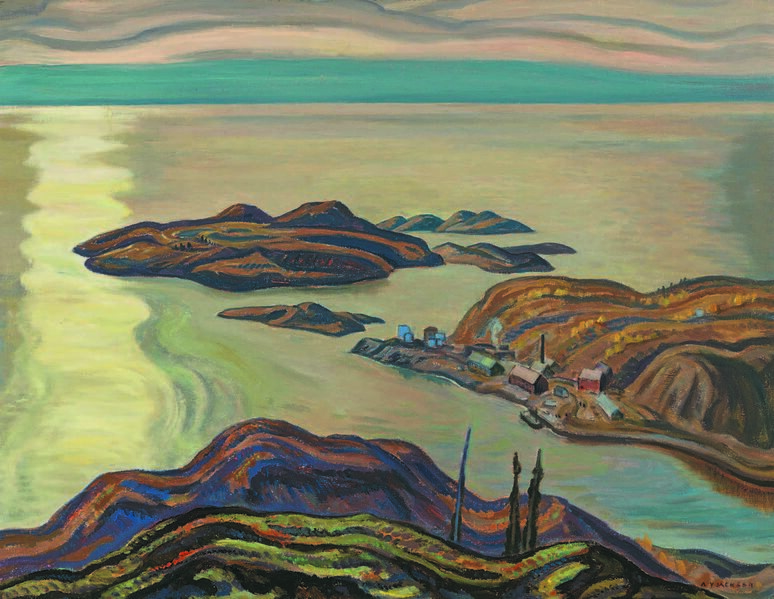 He first traveled to Port Radium in 1938, when he composed “Radium Mine,” the painting that, 75 years later, is among his more valuable works. Jackson’s expeditions to the Sahtu (Bear Lake) region were funded by Eldorado Mining and Refining, the company that owned the mine at Port Radium, which was nationalized in 1944 to supply uranium ore for the Manhattan Project (Bothwell, 1994; Jackson, 1976; Mingay, 1977). During this and later visits in 1949 and 1959, Jackson produced a huge body of workconsisting of sketches and oil paintings, some held by the National Gallery of Canada, and many owned by private collectors. These works were displayed widely, lauded as seminal to the Group of Seven and the Canadian art scene. With accolades from institutions with “‘national’ mandates” (Jessup, 1998, p. 203) like the National Gallery of Canada, the Group’s vision of the Canadian landscape gained significant clout. Recently, the National Gallery of Canada has organized exhibitions like “Terre Sauvage: Canadian Landscape Painting and the Group of Seven” (2001)—named after Jackson’s own painting, “Terre Sauvage” (1913)—and the retrospective exhibition “The Group of Seven: Art for a Nation” (1995), showcasing the persistent power of the Group’s vision of Canada. While Jackson’s landscape paintings can be read as “devices of colonial legitimation” (Bordo, 1997, p.29), his Port Radium scenes are unique in their depiction of industrial action in the very unpeopled wilds decried by anticolonial critics. His minescapes are a hybrid space where ‘rural’ life meets ‘urban’ demand. Jackson represented Great Bear Lake as a wilderness enrolled in industrial development, churning out radium and uranium ore. These pictures complicate the wilderness ideal by picturing an industrial, capitalist facet of the modernist Canadian agenda for the north. In this sense, Jackson’s Port Radium images represent a new phase in the twentieth century Canadian national imagination, a phase of industrialism at the margins, a phase “Beyond Wilderness” (O’Brian and White (eds. ), 2007). 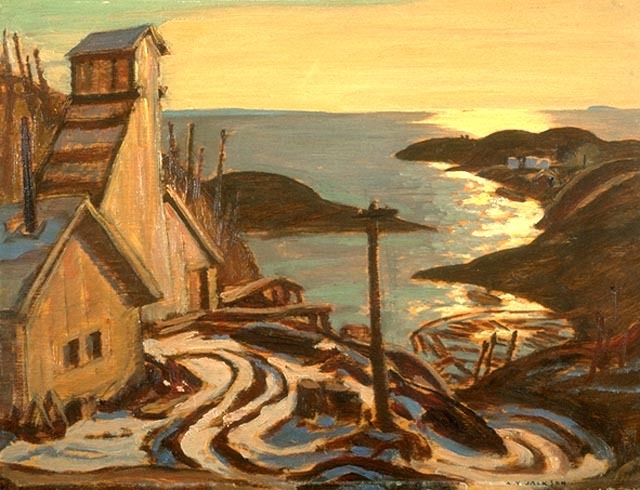 As Jackson’s industrial scenes of mining on Great Bear Lake were combined with the wild hinterland and the terra nullius of other Group of Seven paintings, Port Radium was disseminated not as a violently industrial project but as a benign facet of the land. Read in this light, the Port Radium paintings describe the minesite as wild-hinterland, radium extraction as landscape. They naturalize industry as part of the northern scenery. Note, for example, the lighting in Jackson’s “Radium Mine, Great Bear Lake” (1938) (not to be confused with “Radium Mine” cited above). Head frame, muskeg, and outcrop blush in the indiscriminate gold of the setting sun; oil tanks and snow glimmer the same bright white; utility pole and jack pine stand in shadow, side-by-side in the Canadian north. A viewer would not be remiss in thinking that this Port Radium is simply a part of the land, ‘nature,’ glowing on the shores of a shimmering lake. With a similarly gilt effect, the minesite finds itself in the same tranquil light in “Radium Mine” (1938), From a higher vantage than “Radium Mine, Great Bear Lake,“ the viewer can no longer see the mine head frame. Instead toy-sized buildings in the middle right of the painting, made small by rolling hills and epic lake, puff their warmth from tiny chimneys. The scene is surprisingly domestic; the viewer imagines the mining man sitting down to dinner in his cozy cabin; warm in the waning northern sun. Jackson’s Port Radium works are most confounding when the landscape productions of both of artist and miner are understood in tandem: Jackson sitting on knoll or muskeg, donning a black beret, wielding pencil and brush, and sketching the Sahtu, as he described it, “with its moss and lichen and small plants turning red and orange” (Crawley, 1941; Jackson, 1976)—his colleagues and friends at Eldorado, meanwhile, mapping very different facets of the land, digging deep below moss and lichen, to extract high grade radium and uranium ores. In his work at Port Radium, Jackson was both painter and prospector, artist and amateur geologist—straddling an uneasy line between art and science that lies hidden in his canvasses. Despite the reverence for the landscape expressed in these works, they were nonetheless complicit in colonial expansion, and reliant on an industrial program that dismantled the very “wilderness” they depict. It is through this duplicity that A.Y. Jackson’s representations of the Sahtu, the Great Bear Lake region of the Northwest Territories, can be understood, not simply as representations of a place, but as stories enacting a discourse about that place which normalized the industrial development of the north while erasing Sahtúot’ine, the Bear Lake people, from popular, southern Canadian perceptions of the region. Carmella Gray-Cosgrove is an MA Candidate in Geography at Memorial University. Her research examines representations of uranium landscapes in the Sahtu Region, Northwest Teritories. Bothwell, R. (1984). Eldorado, Canada’s national uranium company. Toronto; Buffalo: University of Toronto Press. Crawley, R. (1941). Canadian Landscape. National Film Board of Canada. Jasen, P. J. (1995). Wild things: nature, culture, and tourism in Ontario, 1790-1914. Toronto: University of Toronto Press. —————– (2002). The group of seven and the tourist landscape in Western Canada, or the more things change. Journal of Canadian Studies, 37(1), 144-179. Mingay, Jane. “Interview with Dr. Maurice Haycock” Mingay Historical Project – The Artists. National Archives of Canada, RG 134. O’Brian, J., & White, P. (2007). Beyond wilderness: the Group of Seven, Canadian identity and contemporary art. Montreal: McGill-Queen’s University Press.